Rice arrives at our mill with an outer hull on the grain. During the milling process the hull is removed, leaving the fiber and nutrient-dense bran layers covering the white inner part of the grain. These bran layers have a light brown color, and contribute a subtle nut-like taste and somewhat chewy texture. Adolphus® Whole Grain Brown Rice contains naturally occurring rice bran oil. For increased shelf life, it is recommended that brown rice be refrigerated. Brown rice is a good source of whole grain dietary fiber. Just like long grain white rice, our brown rice is grown in the U.S.A., and is Kosher approved. 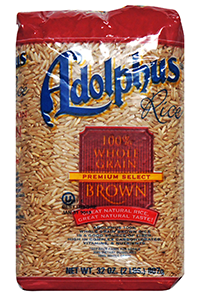 Adolphus Whole Grain Brown rice is available in a 32 oz. (2lb.) stand-up package. 1. Measure 2 cups water, 1 cup of brown rice and (if desired) 1 teaspoon salt and 1 tablespoon butter or margarine into a larger saucepan. Bring to a vigorous boil. 2. Turn heat down very low, cover with a tight fitting lid, simmer without lifting lid for 40 to 50 minutes. Not a significant source of vitamins A & C, and calcium. * Percent Daily Values are based on a 2,000 calorie diet.